How to manage company data ? How to manage employee records ? How to make these records available anytime for manipulation ? How to manage attendance records ? How to deal with employee absenteeism ? How to implement an effective leave management system for employees? How to devise a system for shift management ? How to get reports as I need? How to get them customized? How to have a complete HRMS solution for my organization ? Our attendance software is here to solve all your HR problems including the above concerns. The only thing we are not able to provide at present is an inbuilt payroll system. But we allow our software integration with the third party payroll applications. And hopefully very soon, we will have an integrated payroll system in our attendance software itself as we believe this is one of the most important requirement with any HRMS application. SmartSuite Software is available in two versions – Demo/Evaluation Version and Paid Licensed Version. The demo version is a test version of the attendance software. The demo version is limited to just 5 users/employees but has all available features as the paid licensed version. You can evaluate our demo version before making a decision on the paid licensed version. You can evaluate our attendance software by either downloading and installing the evaluation package of the attendance software on your PC or by testing out the online demo of the software. View more presentations from aksbioenable. 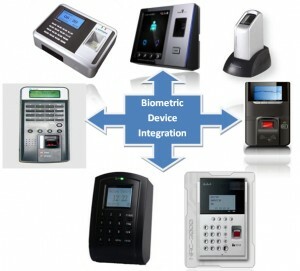 Apart from manual time attendance recording, smartsuite software also allows for automatic attendance update by enabling your biometric attendance device to be integrated with our attendance software. Once the integration is successful, the logs are updated automatically in the software at the specified time intervals. Thus, device integration enables you to reduce manual interference in the software which in turn saves time and increases productivity amongst your employees.